My IB portfolio has been pretty volatile from day to day since the beginning of October. One day gains have been wiped out by the next day or two. I shouldn't be looking that closely to it. I haven't really adjusted any of my short PUT options, but some are ITM like short 2 PUT on $TD.TO. I wouldn't mind getting assigned and selling covered calls on them. But of course, I would be buying them at almost 52 weeks highs. I need to be more active in the markets to make more money. Usually, I sit on the sidelines just watching... yesterday, I was very well tempted with making a play for $NFLX earnings. But of course, I hesitated and didn't make an option play. Today, I am itching for a play. A play that hopefully will double my money. I bought a long CALL on $MSFT before their earnings on October 24th. Hopefully, my bet will be a good one and I can reap some rewards in it. Of course, I usually sell prematurely on my CALL plays... I hate losing my premiums and want to lock in my gains. This may be done prematurely as I currently have PUTS expiring on both stocks for Oct 19, 2018, but they are OTM for now. ACB.TO & APH.TO were down today. So I decided to sell some more PUTS on them. Market correction in its wake? What a roller coaster ride October has been. I sold a few out of the money PUTS just before the massive sell off when I should have bought PUTS, but I didn't see it coming. Currently, I am still holding all my short PUTS. A lot of them are underwater right now deep in red. I am hoping today is the start of the market rebounding. But we could see more red days than not in the coming weeks or months perhaps? 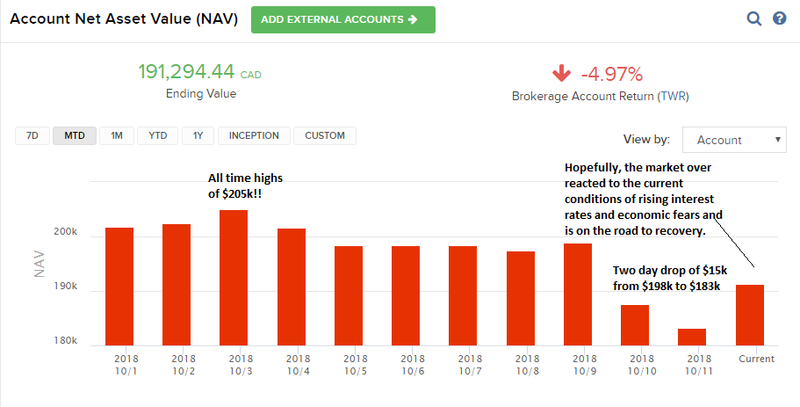 Oct 3rd, I reached my all time highs in my IB portfolio of $205k! I am very heavily weighted in US tech stocks particularly in $AAPL. But the market decided to turn its ugly heads. I know a lot of people took advantage of the drop by shorting stocks and long PUTS. But I was stunned and I froze like always... I didn't watch the blood bath. I only looked at my portfolio at the end of day and saw the big losses that had incurred. Luckily, I have a lot of margin room to not get a margin call... and most of my short PUTS are expiring on Nov 21st. Premium collected $65 CAD minus $1.50 commission fee. If DOL.TO is trading below $38.00 per share, I will be assigned 100 shares with an average price of $37.35 per share. If DOL.TO is trading above $38.00 per share, I will pocket 1.71% from this trade. I've been busy at work lately, but I managed to sneak in some trades during my morning work hours. I always seem to miss the boat on $NVDA. Friday, it jumped 5%... at least I sold a PUT for some premium earlier in the week. Now, it's way OTM. Thursday night, I noticed that Elon Musk was being sued by the SEC over an alleged Tweet on going private. Shares took a tumble on Friday by 13.9%... I took this opportunity to sell very safe OTM puts on $TSLA. Looks like Elon Musk pulled a quick settlement by paying the SEC $40 million dollars and stepping down as Chairman of Board but he will still remain CEO. With this new, shares should jump back up after the initial scare and I should pocket an easy $402 in premiums within time. I am glad I made the move as of writing this 12:46pm... my short PUTS would have cost me 36c to close out which I would have taken a loss on this BULL PUT SPREAD. It is 1:00pm, $NVDA actually closed at $263.45 which is above my short PUT... ugh, I could have profited $24 and saved on commissions of $6.67. But what a ride out that would have been! Realized profit for the week: $556 less $24.41 in commissions. Commission was higher due to my bull put spread. 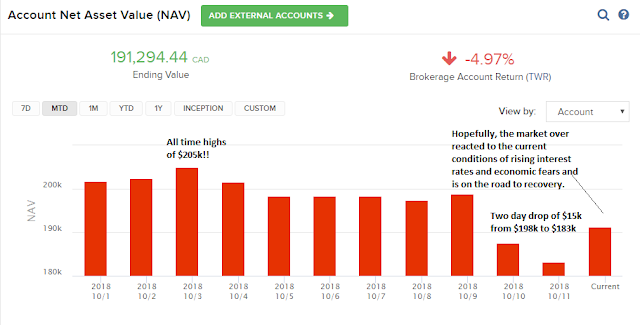 I opened my bull put spread on $NVDA on Tuesday (3 day hold)... even though it uses less margin to open the option, it does add up commissions and your risks are inherently higher when your PUT is at the money. Time to sell more NAKED puts further expiration dates with wider out of the money strike prices. Today, SOLD 2 $ACB TSE Oct19'18 10 PUT @ 0.75. Awesome premiums for $10 strike price. Right now, I'm at a loss as $ACB.TO dropped quite a bit in the last part of the day. Yesterday, I also open $NVDA bull put spread: 8 $162.50/$157.50P @ 0.27 expiry date Sept 21th. Right now, $NVDA is trading at $271.80 per share. Yesterday, I closed my 2 $INTC 46 PUT @ 22c from 69c. Profited $94 USD.